A perfectly summery Strawberry Tart made with a buttery crust, a smooth cream cheese-based filling, and fresh summer berries! 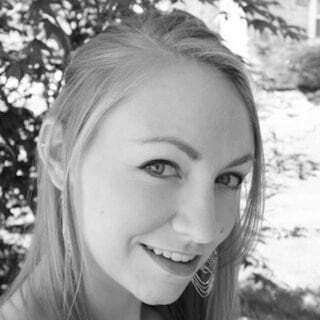 Sam here from Sugar Spun Run with another sweet recipe! 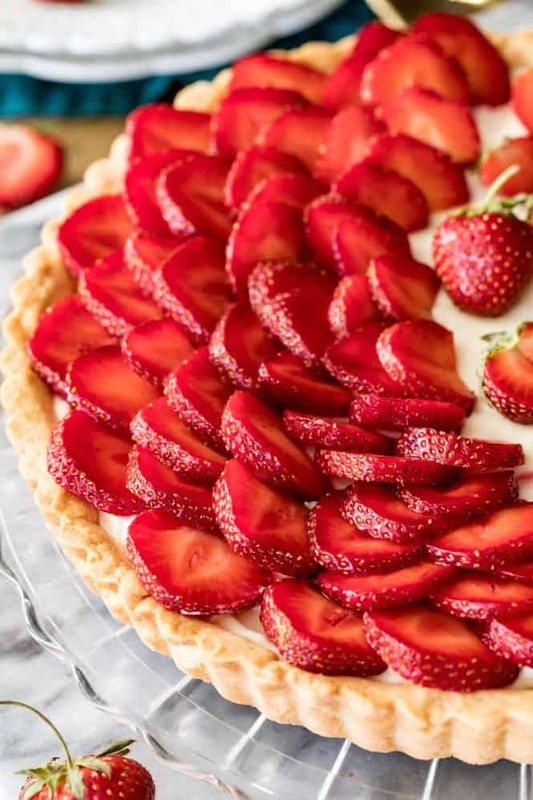 Today I’m showing you how to make a sweet, simple and from-scratch Strawberry Tart. 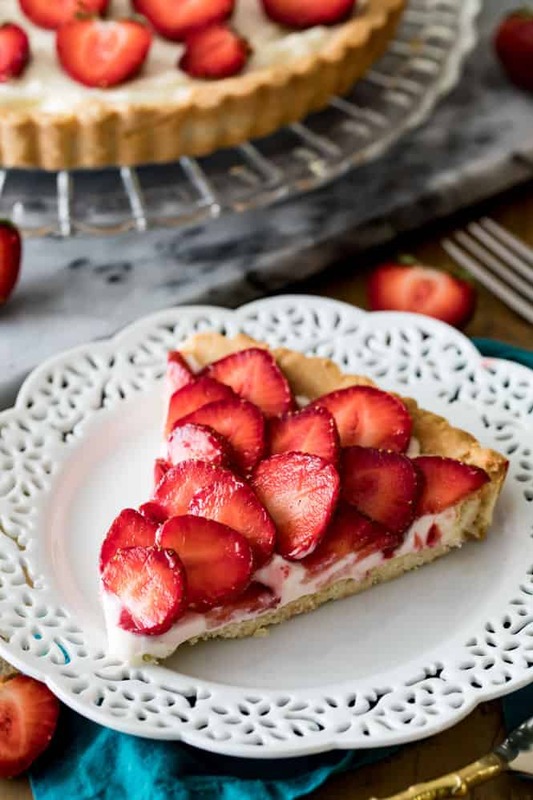 I’ve been sharing plenty of strawberry recipes recently, from my Strawberry Shortcakes to my served-with-strawberries Angel Food Cake, and today I want to share this sweet and simple strawberry tart. It’s just as tasty as it is beautiful, so let’s dig right in to how to make your own. The first thing we’ll start with is our buttery shortbread-esque tart crust. I make this tart using a food processor and recommend that you do the same as I’ve found this to be the easiest way to make a tart crust. The food processor does all of the hard work of cutting in the butter without allowing it to soften from over-working and it makes quick work of your dough. While you could make this crust with a food processor or a box grater (shredding your cold butter with the box grater before working it into your flour mixture), it tends to take much longer to get the dough to actually cling together like you need it to, and the butter tends to begin to melt from being over-worked. It’s also very important that you allow the dough to chill in the freezer for at least 30 minutes once you’ve formed it into your tart pan. This will keep the dough from shrinking too much when you transfer it into your oven. As you can see I took a sort of half-and-half approach to decorating my strawberry tart. I decorated half with rows of sliced berries while decorating the other with fewer small berries that I sliced in half. I chose to decorate mine this way because I knew I’d be sharing this tart with my siblings who like a higher filling to fruit ratio. You can of course decorate this tart anyway you’d like, it would look just as pretty completely covered in strawberry slices! 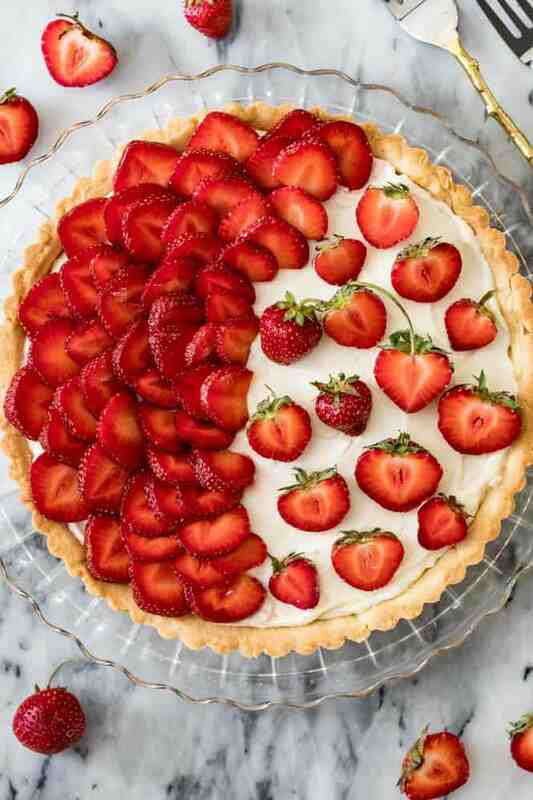 A summery Strawberry Tart made with a buttery crust, a smooth cream cheese-based filling, and fresh summer berries! Combine flour, sugar, and salt in the bowl of a food processor and pulse to blend. Scatter butter pieces overtop the flour mixture and pulse until mixture is just beginning to cling together. Remove from food processor and form into a disk. Cover in plastic wrap and chill for 30 minutes. Once dough is finished chilling, remove from refrigerator and roll into about a 10-11" circle. Form into a 9" tart pan and use a fork to poke holes into the side and bottom of the dough. Transfer pan to freezer and freeze for at least 30 minutes. Preheat oven to 350F, and once oven is preheated and dough has chilled, bake on 350F for 25 minutes or until just beginning to turn golden brown. 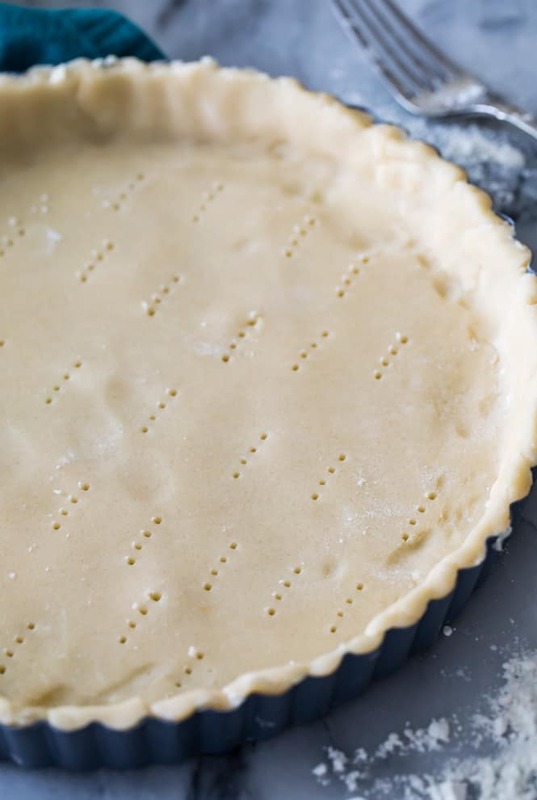 Allow tart crust to cool before filling. combine cream cheese, powdered sugar, vanilla extract, and salt in a bowl and use an electric mixer to beat until smooth and well-combined. Set aside. Fold the whipped cream into your cream cheese mixture until well-combined -- the resulting mixture should be thick and fluffy. Spread evenly into cooled tart crust. Top with sliced strawberries -- You can decorate your whole tart using sliced strawberry pieces or you can use the technique I used and cover half of the tart completely with strawberries and decorate the other half with small halved berries. Thank you for all of the delicious recipes you share with us ! would this be considered a medieval recipe? haha. I am not sure. They do have a medieval strawberry tart and it is similar to the same recipe they have online. Do you know? !